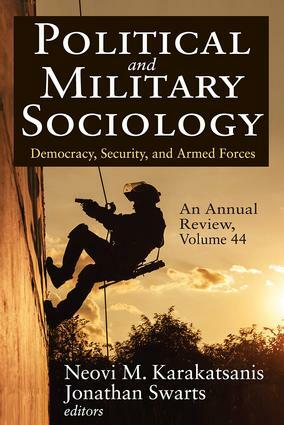 The latest volume of the Political and Military Sociology annual review features empirical research on topics that focus on security, military training, culture, and the challenges of bureaucracy, law, and violence in democracies. The articles cover an impressive geographic range from Europe to Africa and to the Middle East.Two essays address threats to democratic polities by corrupt governmental and legal institutions and by electoral violence and intimidation. The first argues that a culture of "dualism" in Greece helps produce problems. The second analyzes the power of military student fraternities in Nigeria, arguing that democracy is threatened by these organizations.Two contributors then address the security and military challenges in Iraq. The first argues that successful military advisors must play dual roles as both peacekeeper-diplomats and warriors. The second poses that Iraqi government policies privileging the Shia population have alienated other groups�and helped support for groups such as ISIS. The final essay analyzes the acculturation of new soldiers to Zimbabwean military life through the training experiences of recruits.The volume also includes reviews of recent books on military and security matters.